5 References Argon, E.B. (2012). Tawa-tawa contains active ingredients that may help dengue haemorrhagic fever (DHF) patients-study. Available online at 18 Nov 2013 at http://www.pchrd.dost.gov.ph/index.php/2012-05-23-07- 46-36/2012-05-24-00-01-32/5296-tawa-tawa-contains-active-ingredients-that-may-help-dengue- hemorrhagic-fever-dhf-patients-studyhttp://www.pchrd.dost.gov.ph/index.php/2012-05-23-07- 46-36/2012-05-24-00-01-32/5296-tawa-tawa-contains-active-ingredients-that-may-help-dengue- hemorrhagic-fever-dhf-patients-study Dengue Fever. (n.d.). In Wikipedia. Available online 18 Nov 2013 at http://en.wikipedia.org/wiki/Dengue_fever http://en.wikipedia.org/wiki/Dengue_fever Fisk, M. (n.d.). Recommended Aerobic Exercise Classes for Kids. Available online 18 Nov 2013 at http://everydaylife.globalpost.com/recommended-aerobic-exercise-classes-kids-17446.html http://everydaylife.globalpost.com/recommended-aerobic-exercise-classes-kids-17446.html Nakhoda, N. (2012). Childhood obesity – An Urgent Health Problem. Available online 18 Nov 2013 at http://www.mdhil.com/childhood-obesity-an-urgent-health-problem/ http://www.mdhil.com/childhood-obesity-an-urgent-health-problem/ Hart, A. (2012). Writing cartoon animation scripts with your kids about healthier food choices. Available online 18 Nov 2013 at http://www.examiner.com/article/writing-cartoon-animation-scripts-with-your-kids- about-healthier-food-choiceshttp://www.examiner.com/article/writing-cartoon-animation-scripts-with-your-kids- about-healthier-food-choices Stratton, E. (2013). Children urged to eat their vegetables. Available online 18 Nov 2013 at http://www.dailyastorian.com/your_town/seaside/children-urged-to-eat-their- vegetables/article_d4a2bc8e-45ef-11e3-80ff-001a4bcf887a.html http://www.dailyastorian.com/your_town/seaside/children-urged-to-eat-their- vegetables/article_d4a2bc8e-45ef-11e3-80ff-001a4bcf887a.html Texas Heart Institute. (n.d). Heart Disease Risk Factors for Children and Teenagers. 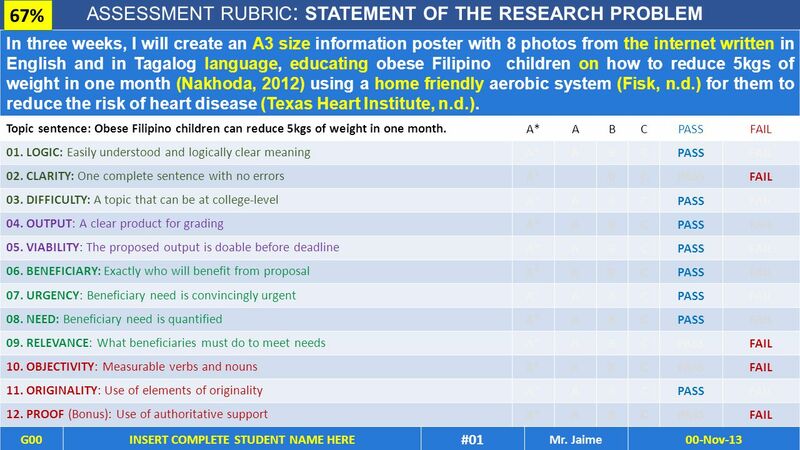 Available online 18 Nov 2013 at http://www.texasheart.org/HIC/Topics/HSmart/children_risk_factors.cfmhttp://www.texasheart.org/HIC/Topics/HSmart/children_risk_factors.cfm You need an article that explains why Filipinos and why mothers are the target beneficiaries The citation needs the paragraph numbers of the ideas that can be used in the proposal. 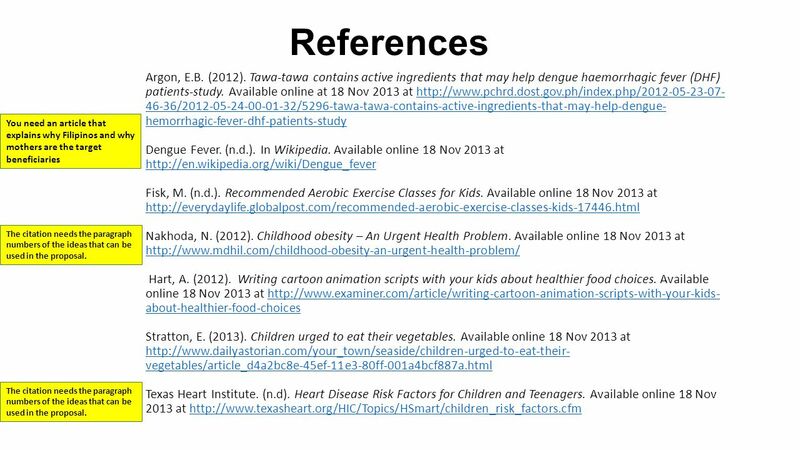 6 Notes Hyperlink the in-text citations. 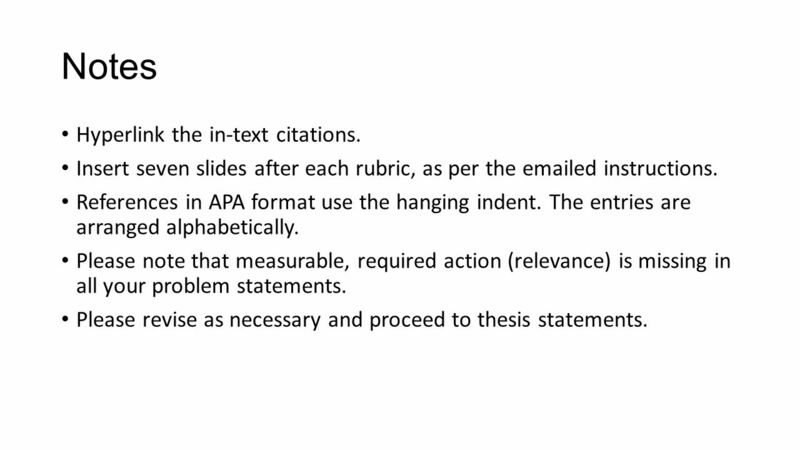 Insert seven slides after each rubric, as per the emailed instructions. References in APA format use the hanging indent. The entries are arranged alphabetically. Please note that measurable, required action (relevance) is missing in all your problem statements. 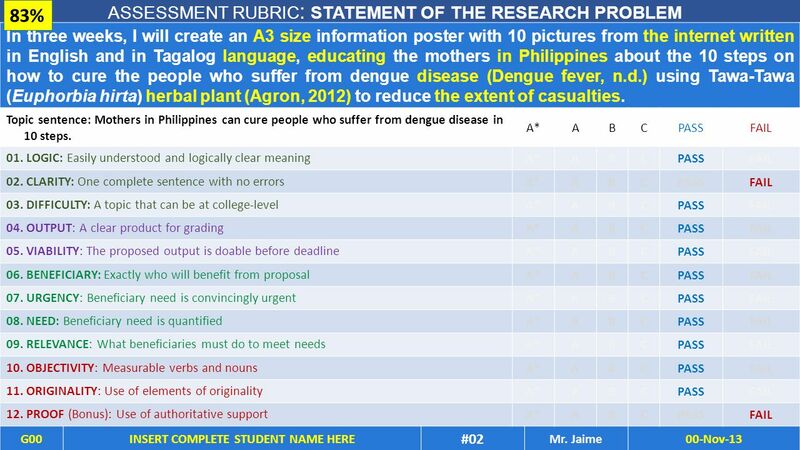 Please revise as necessary and proceed to thesis statements. 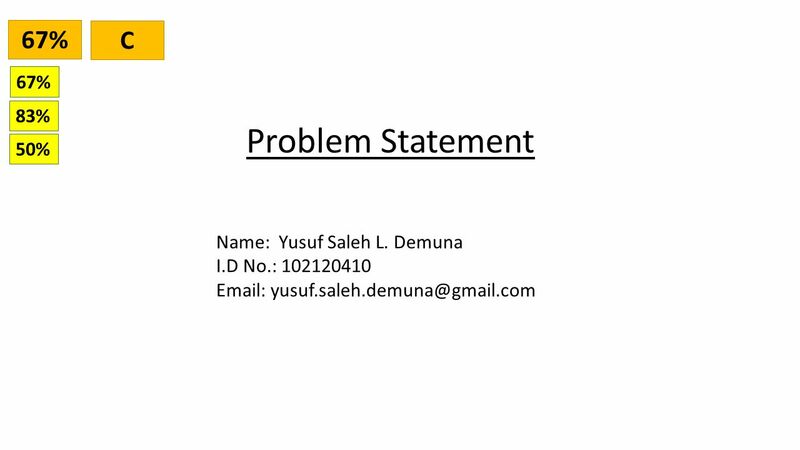 Download ppt "Problem Statement Name: Yusuf Saleh L. Demuna I.D No. : 102120410 67% C 83% 50%"
Mung Bean plant Phosphorusnitrogencarbonpotassium Sodium chloridefluoride. WRITING ASSESSMENT NOTES. PERSUASIVE TRY TO CONVINCE SOMEONE TO AGREE WITH YOUR IDEAS OR OPINIONS KEY WORDS: PERSUADE OR CONVINCE BE SURE TO: Clearly. Media Center Essential Question How can I be an effective user of information? Dinner for Eight A Maths Enrichment Unit Who would you invite to dinner? Proceed to Menu. [View this presentation in Slide Show mode]. What this presentation covers: Frequently Asked Questions 3 Steps in Referencing In-Text References: rules.  Edexcel Exam board (  20% Listening (exam)  20% Reading (exam)  30% Speaking (controlled assessment)  30% Writing (controlled. “I Can” Statements 5 th English/Writing 1 st Six Weeks. THEORY PRESENTATION BY LAST VIEWED NEXT SLIDE LAST SLIDE FIRST SLIDE PREVIOUS SLIDE END SHOW Flag of Pakistan courtesy. 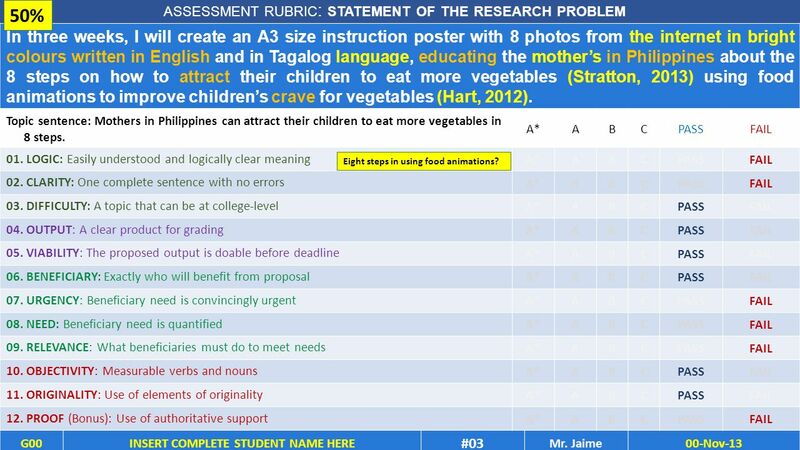 PROBLEM STATEMENT ASSESSMENT RUBRIC Abdilhamid Osman G10 42% 50% 42% 47% E.
72% B 83% 50%. In three weeks I will design an information poster with 10 colorful pictures created by me in English and Pashto about how to cook cheap. Fast Food Who’s to Blame? Fast Food : Unit One. Ameroden Datusolaiman Lao, Lanao Del Sur, Marawi City 9800 Philippines Using Maslow’s Belonging Needs to Reduce Cancer. Writing Information 101 Paragraphs A paragraph is a group of sentences that presents a main idea and related details to a reader. A paragraph is a group. Your Name and Period. Introduce the disease  This should be in a paragraph form. NOT in bullet form.